The sailplan requires just 2 lines to control and the boat can be set up in less than 5 minutes. The patented kick-up rudder system allows full beach landings with no problems. The hard-chined hull and low sail plan provide unmatched stability and a forgiving feel. The Sunfish hull is light enough to throw on top of your car with ease, and the bulletproof Laser Performance construction ensures that your Sunfish will provide years of virtually maintenance free enjoyment. The Sunfish combines performance, stability and durability in a package that appeals to beginners and experts alike. If it's racing you crave, the International Sunfish Class has a full time staff that sanctions more than 1000 events each year. Add the hundreds of local and regional events to that list and you can stay pretty busy racing your Sunfish. The class will keep you posted with its quarterly magazine "Windward Leg" and provide valuable preformance tips. The elegant simplicity, performance, and intelligent economy of the Sunfish is unmatched. The Sunfish enjoys fantastic resale value. Old or young, tall or short, expert or beginner, the Sunfish will provide you with years of fun and write your ticket to the wet world of wind. 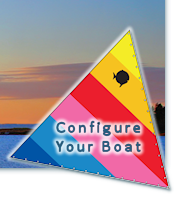 You will find Sunfish in resorts around the world and in your own backyard. When you are ready for hassle-free fun in the sun give us a call to learn more about today's Sunfish. Convenient storage in the back of cockpit which is perfect for extra gear or a cooler. Patented kick-up rudder makes beach launches, landings, and shallow-water sailing effortless. Hydrodynamic daggerboard maximizes upwind performance. Mainsheet is the only control line that you need to use to enjoy the simple pleasures of sailing a Sunfish.